No matter if you’re logged in on ACX or not, there’s a giant purple search window at the top of the page. Type in either the author, the title, the ISBN or the ASIN of the book project you’d like to create. Hit “search” and a list of items should be shown. In an ideal world, this should bring up a list similar to this one. 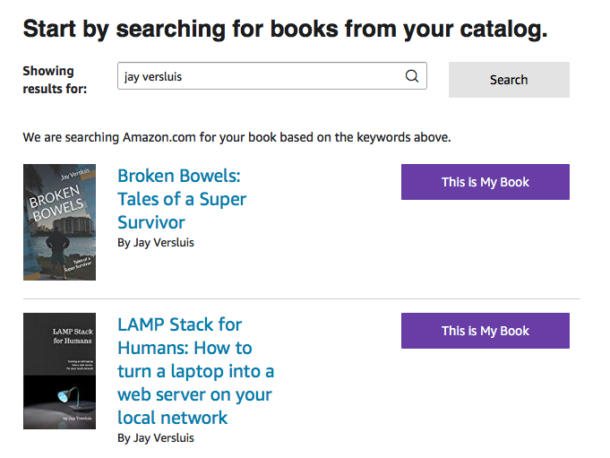 You have to select the bug purple button that’s labelled “This is My Book”, after which you’re prompted to login to ACX (using your existing Amazon credentials). 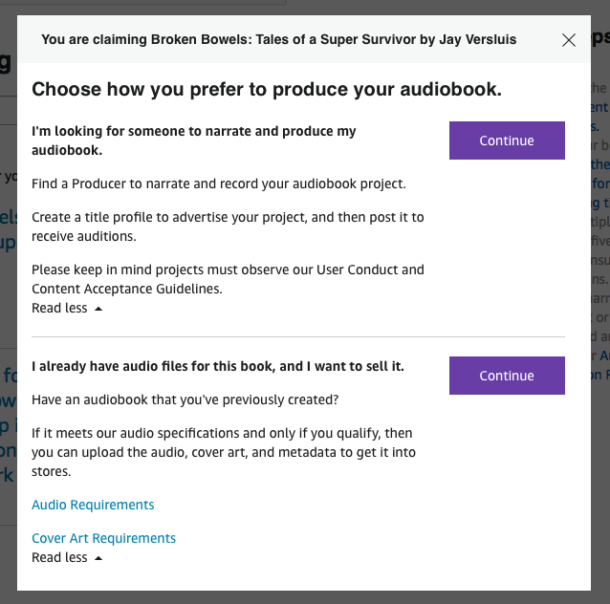 Now you can start the auditioning process for narrators, or upload files for a project you already have. In my case, this list and the above options only ever came up when I was logged out, but never when I was logged in. Even when I was logged out, picked my book, and logged in with my credentials, all I saw was the ACX home page with nothing else – albeit a super long URL in the browser bar. Something was wrong, without a sliver of an explanation as to what the trouble was. Turns out that when I signed up to ACX, I chose to do so as a Narrator. After all, that’s what I wanted to do, narrate my own book. I had (foolishly) assumed that it probably wouldn’t make a difference going forward, and should I choose to narrate other people’s books some day, this would be a safe option to pick. But that’s not how it works, and ACX don’t explain this to you. 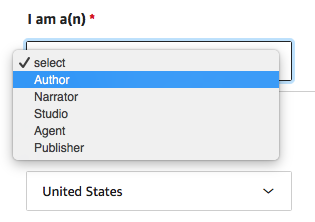 During the signup process, even with an existing Amazon account, you get a very small drop-down menu without any explanations as to the importance of the outcome of what you pick. If you want to produce and narrate your own book, it is absolutely crucial to pick anything other than Narrator from this list. You’d think they tell you just how important this choice is for your ACX future, or at least hint at the implications as to what choice will do what going forward. But as of 2018, that’s not the case. Perhaps the ever so “booming Audio Book market” isn’t booming as much as industry papers want to make us believe. With a new Author Profile (and a new set of Amazon credentials), I was able to select my own book and fill out the following sections about rights and and distribution. Finally! Since ACX will act as an intermediary between you and audio book retailers (Amazon, Audible and iTunes), they do take a cut of the proceeds. Even though they’re an Amazon company, they do have to get their money from somewhere I guess, and the best distribution deal you can get is 40%. The final step in the process is to agree to the terms and conditions, and with that out of the way, you can upload your cover art and audio files, together with some meta data. And that’s it! Very straightforward once you know that there’s a difference between Narrator and Author/Producer/Studio profiles. I could have saved myself a lot of hassle had I known about that, which I would have, had someone put a simple one-line explanation on the ACX website. Or – dare I dream – an error message the moment you try produce a book and your profile isn’t the right one. Or – even crazier – let users CHANGE the type of profile they have in retrospect. But no. That’s just not how it works.